Lynnette teaches both group and private classes from her home studio in Torquay, Victoria and also at Louise Macdonald Milliner's studio in the Melbourne CBD. Learn the techniques which exemplify Lynnette's signature looks. Limited places available - maximum of 5 students each group class in Torquay. Please read the Workshop Terms and Conditions. Drape your own choice of fabric over a blocked esparterie (sparterie, spartre) foundation to create an on trend button beret style hat. This two day workshop will include how to block the foundation material, flawlessly cover the base with fabric and create a coordinating fabric trim. We will explore various methods of draping to perfectly play up your piece of fabric. The following workshops have been run previously. Please contact us for further information about these courses. Learn my signature technique and add some edginess to your millinery using traditional flower making techniques to create some futuristic flora. You will learn to make a range of fancy flowers and lovely leaves and arrange them into a regal crown. Learn the basics of flower making using time-honoured (and some modern) techniques including tinting and shaping with traditional tools. 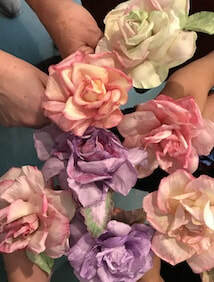 Participants will make a variety of flowers, such as a rose and orchid, using these techniques. Make a button beret covered in luscious leather. Learn how to make a fabulous foundation to successfully block your leather. You will also craft a stunning leather trim to top off your creation. Push your creative boundaries! Leave those limiting blocks and create a small hat or headpiece from wire. In this course you will learn how to fashion a shape from millinery wire, cover your frame and explore appropriate trims for your design. Beginners will make a wire tiara and more experienced students will create a Boater shaped hat. Let your trims look like they have fallen from the sky onto your hat! In this course, Lynnette will show you how to balance and attach your trims to produce a feature that floats as light as a feather around your head. Make the perfect piece for Spring – create a fabulous floral crown that will make you feel like a queen! In this 2-day course you will make some fantastic flora out of leather and arrange them into a heavenly halo. I will show you how to use traditional millinery and flower making techniques to make your own modern masterpiece. ​Stow the straw, forget the felt and create a Boater hat from wire! You will learn how to form a Boater from millinery wire using various methods of wire joining, explore the best materials to cover your frame and appropriate trims for your hat. Leave those limiting blocks and create an on-trend tiara from wire! You will learn how to fashion a tiara from millinery wire, cover your frame and explore appropriate trims for your design. This course covers 2 days of a 5 day Millnery Intensive. Learn how to use wire techniques to make your hat bases and trims effortlessly appear to defy gravity! Get your vintage on and discover the beauty of racello braid. Explore the possibilities of working with this magnificent medium. In this two-day workshop, you will make a small hat using racello or vintage braid. You will learn how to shape and weave the braid to create a spectacular hat and top it all off with a fitting trim.